Teenagers are not the only ones suffering from acne. Even adults have them too. Many people want to get rid of acne fast. For this reason, numerous home remedies have been popping out, which are claimed to heal acne breakouts. However, not all of these so-called remedies can actually help cure zits and acne. 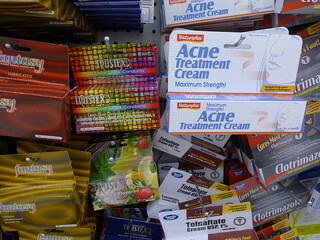 Find out which of these claims are true about adult acne. 1. You’ll grow out of acne once you go past teenage years. Wrong! Acne can affect any age group. In fact, you will be surprised to learn that acne is fairly common in women in their 20s. Based on a survey of 1,000 adults, 50% of women in their 20s suffer from acne. 35% of women in their 30s and 26% of women in their 40s suffer from acne. Between men and women, the latter often suffers from acne due to surges in estrogen, which can consequently increase oil production. Excess oils can cause dirt to stick easily, clog pores and eventually cause bacterial inflammation. 2. The sun is good for acne. The sun can initially do wonders to your acne by drying it out. However, too much sun exposure can break down the skin’s collagen, causing wrinkles and pores to open. In addition, the sun can cause acne scars because although it will dry them out, your skin would have difficulty repairing itself. Don’t forget that UV rays can also cause skin cancer. 3. Blackheads are just dirt trapped in your pores. Again, this is just a myth. Blackheads are actually a combination of old skin, debris and oil. Once exfoliation does not happen, they clog the pores which then become blackheads. They are not dirt, that’s why dermatologists prescribe topical tretinoin to remove them. 4. Acne products with stronger formulation are more effective. When it comes to acne products, people have the notion that those containing higher amounts of benzoyl peroxide and salicylic acid are more effective. However, according to Expert Opinion Pharmacotherapy, there is no significant difference between 2.5% and 10% benzoyl peroxides. 5. Breakouts mean you don’t wash your face enough. It is true that not washing your face can cause pimples and acne. However, washing your face frequently would not improve your skin condition. Frequent washing will strip your skin of its natural moisture. Once your skin becomes dehydrated, it will compensate by overproducing oils. This can cause clogged pores and dirt to accumulate. 6. Eating chocolates can cause acne to worsen. This is not exactly true or false. Actually, sugar is the main culprit in acne worsening. So if you eat dark chocolates instead of the sweetened ones, it will not cause acne or pimples to break out. 7. Toothpaste can help heal acne. Toothpaste contain triclosan, baking soda, alcohol and hydrogen peroxide. Many people think these ingredients can dry up a pimple. However, toothpaste products may contain chemicals, mint and other flavorings such as cinnamon, spearmint and peppermint. These chemicals can cause skin reactions such as rosacea on the chin and around the mouth.